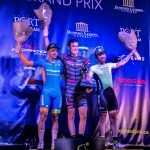 Port Coquitlam, BC – November 26, 2015 • Thousands of spectators will gather in Port Coquitlam July 12, 2016 to watch top international cyclists race through the downtown streets during a new BC Superweek event: the PoCo Grand Prix. Representatives from the city, BC Superweek and Canada’s professional cycling community announced today (Nov. 26) that Port Coquitlam has signed a five-year agreement to be a host city for BC Superweek, the nation’s biggest professional road cycling series. Held the second week of July each year, BC Superweek features more than $120,000 in prize money, with eight races over nine days. 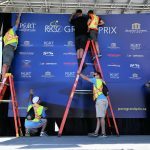 The PoCo Grand Prix will be held on the second day of the series, joining the Tour de Delta, Global Relay Gastown Grand Prix, Giro di Burnaby p/b Appia Development, and Beverley by Cressey presents Tour de White Rock. Residents and visitors can look forward to an exciting afternoon of sport, live entertainment and cycling-related activities on July 12. The criterium-style race will feature a mass start and a 1.3-kilometre circuit that cyclists will navigate for 40-65 laps. Approximately 200 male and female cyclists will whiz by about every minute, making for an exciting spectator experience. The day will also include races for children and youth, and a Corporate Challenge. The proposed racing course includes parts of Shaughnessy Street, Elgin Avenue, Mary Hill Road, McAllister Avenue, Donald Street and Wilson Avenue. 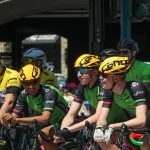 The route is now being finalized by the event organizers – a city-led advisory committee with representatives from former host cities, BC Superweek, the Port Coquitlam Business Improvement Association and local cycling-related businesses. Port Coquitlam was one of several Lower Mainland communities scouted by BC Superweek when the second event in the series, formerly hosted by the University of British Columbia, became available. The city’s enthusiasm, central location and downtown race site were among the deciding factors in selecting Port Coquitlam. The committee has begun discussions with properties that will be affected by the road closures on the afternoon of July 12. Alternate routes will be provided in and around the downtown that day for vehicle, transit and foot traffic. Businesses and the community will be encouraged to participate in the event in a variety of ways, including sponsorship, volunteering and participating in public cycling events for children, youth and businesses on July 12. The city and advisory committee are working to secure a name sponsor for the race, and are offering a variety of sponsorship and marketing opportunities. Businesses that want to be involved are invited to email grandprix@portcoquitlam.ca or contact Lori Bowie at 604-927-7907 for more information. Opportunities for community involvement will include subcommittees to the advisory committee and more than 100 volunteer positions. Volunteer information is available at www.portcoquitlam.ca/volunteer. Event and sponsorship details have been posted at www.pocograndprix.ca.